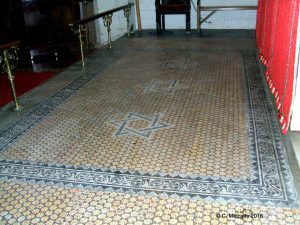 The tesselated pavement of the Sanctuary in St Swithun’s church is striking and unusual. It is made from small pieces of stone of different colours to create the pattern. There are entwined leaves, which resemble patterns on Roman mosaics, and there is an interlinked star pattern. 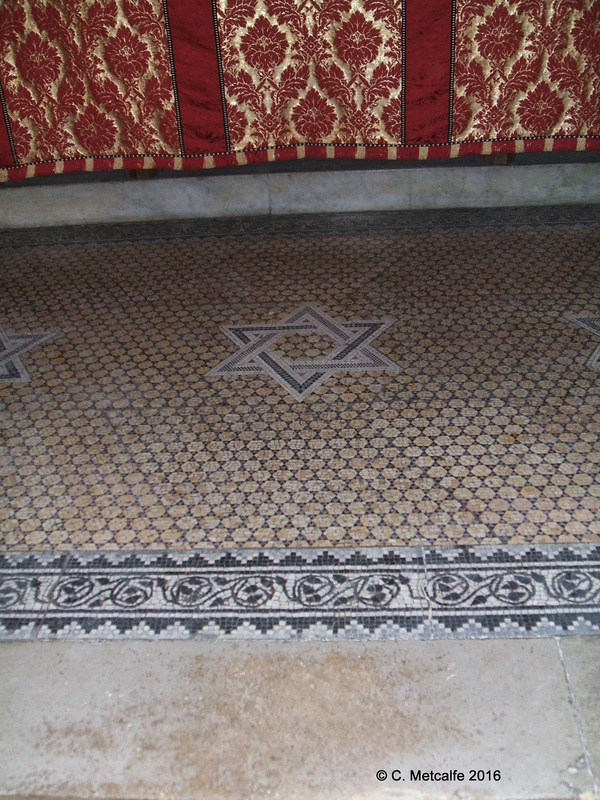 Visitors sometimes ask if this represents the Star of David. The answer is that we don’t know and the whole mosaic, its creators and the reason for its installation are shrouded in mystery. In the 1930s, an article in the St Swithun’s Parish Magazine suggested that this mosaic was ‘very probably’ the work of Constance Kent whilst she was in prison for supposedly murdering her half brother, Francis Saville Kent, in 1860. However, I have not been able to find records about the acquisition of this floor. The Chancel was re-ordered in the 1870s, and the mosaic may have been laid then. Constance Kent may have been part of a team of prisoners who made mosaics, breaking stone into small pieces, creating geometrical patterns pieced together on boards. The mosaics were then dispatched to be laid on the floors of St Peter’s, Portland, St Katherine’s, Merstham, the crypt of St Paul’s cathedral, St Swithun’s, East Grinstead and the Chancel in the Chapel of the Bishop of Chichester’s Palace. This art is called opus sectile. (It uses non uniform pieces which are bigger than in a mosaic). It is also known as opus criminale, because it was made by prisoners. There are 2 published opinions about whether Constance Kent was involved in making the mosaics. 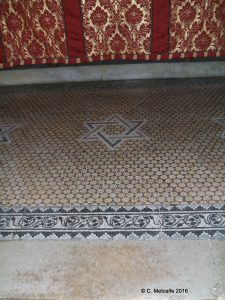 Kate Summerscale in ‘The Suspicions of Mr Whicher or The Murder at Road Hill House‘, argues that Constance ‘was found to be a talented mosaicist‘ and sees the design on the floor of St Paul’s crypt, a little boy with angel wings, as highly significant. An Australian author, Noeline Kyle, argues that Constance Kent did not do mosaic work at all, as this is not entered upon her prison record, now available at the National Archives, Kew. I have found one reference in The Daily Graphic to Constance Kent being involved in mosaic work- but, as yet, nothing to connect her with East Grinstead. The idea that the work is connected to Constance Kent is still popular, and visitors sometimes travel to St Swithun’s in order to see the mosaic. On the morning of June 29th, 1860, at Road Hill House, in Wiltshire, the second youngest child, Saville, was missing. At first, his nursemaid, Elizabeth Gough, who slept in the same room, with baby Eveline, thought that Mrs Kent must have him, because the blankets were neatly folded, so it was an hour before the alarm was raised. Locals helped with the search. The boy’s body was found, throat slit, in the servants’ privy. He was 3 years and 10 months old. A verdict of murder by person(s) unknown was given. The local authorities failed to find the killer. The nursemaid and a deranged bricklayer were suspected, but not convicted. Locals felt that someone within the household had killed the boy. Inspector Jack Whicher was sent from London. He joined the Metropolitan Police in 1837, became a Detective, then Inspector in 1856. His investigations unearthed a household at odds with the respectable image it tried to portray: the first Mrs Kent had been prone to madness, the family could not keep servants for long, Samuel Kent had committed adultery with the governess before his first wife died. Whicher found Constance’s hidden nightdress, missing from the laundry basket though listed in the Laundry Book. He heard a tale of Constance and her younger brother, William, running away in 1856. Constance changed into some of her brother’s outgrown clothes, chopped off her hair and abandoned it, with her dress, in the shrubbery privy. The suspicions of Mr Whicher fell upon Constance, but he could not provide certain proof. Samuel Kent was a dry salter, then an inspector of factories. The big house and household were beyond his means. His first wife, Mary Anne, gave him 4 children in 5 years, (one died) then 6 more (4 died), despite bouts of madness. Constance (born 1844) was the first of their children to survive for almost a decade. The governess, Mary Pratt, started by ‘making a pet’ of Constance, but turned to locking up Constance for several days for the slightest mistake, with only bread, milk and water. Little Saville, according to the nursemaid, was known to tell tales about his half siblings to his mother. On the night of the murder, the Nursemaid, Saville and Eveline slept a few yards away from the Master and his pregnant second wife, on the first floor. The children of the first marriage, 2 older daughters and Constance and William, slept on the second floor, as did the servants. The eldest, Edward, was away in the Merchant Navy. After the investigation petered out, the house was put up for auction and Constance was sent to a French convent in Dinan, where her father and stepmother once visited her. She then went to a High Church retreat in Brighton. 5 years later, aged 21, she travelled to London with the Mother Superior, to confess her crime. ‘The Suspicions of Mr Whicher’ were vindicated. She confessed to the Reverend Wagner, but in court he refused to divulge information heard in confession. Constance claimed that the deed was done to hurt her stepmother, not for hatred of the boy. The Judge, apparently weeping, passed the death sentence. An appeal to Queen Victoria, due to public outcry, resulted in the sentence being commuted to life in prison, which was 20 years, in this case. Constance was sent to Salisbury, Millbank and Parkhurst prisons. She served her full sentence, despite appeals on grounds of her age at the time of the crime- 16. 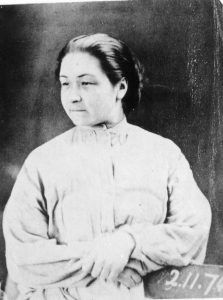 On her release, as Emilie Kaye (her second name and K) she joined William, his wife and some of their half siblings, including Eveline, in Tasmania, where William was Inspector of Fisheries. He produced a book about the Great Barrier Reef. Then she went to mainland Australia, cared for typhoid victims, trained as a nurse, cared for lepers, became Matron for young offenders, opened a Nurse’s home and ran it until her retirement. She lived to be 100, ironically receiving a congratulatory telegram from the King and Queen in 1944, then died 2 months later. A niece was unaware that Emilie was actually her real aunt. Did she confess to protect her father or brother, William, who stood to inherit money when he was 21? Was she mad or sick? At the time the case was the object of enormous public interest, with letters to newspapers speculating on the subject and expressing sympathy for Constance. Wilkie Collins used details from the case in The Moonstone and Charles Dickens, who had already created the character Inspector Bucket in Bleak House, used his own version of events in his last, unfinished novel, The Mystery of Edwin Drood. There were echoes of Charlotte Bronte’s Jane Eyre, published in 1847, because Samuel Kent’s second wife was the governess. This sad tale may, or may not, be part of the history of St Swithun’s church.